NYC, 02/13/2019, 7:00PM. Artist Talk: Interrogating Narrative Tropes. 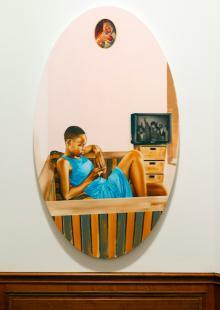 Meleko Mokgosi is an artist and assistant professor of practice at New York University. He received his BA from Williams College in 2007 and participated in the Whitney Museum of American Art’s Independent Study program from 2007-2008. Mokgosi then received his MFA from the Interdisciplinary Studio Program at the University of California Los Angeles in 2011. He participated in the Rauschenberg Residency at the Robert Rauschenberg Foundation, Captiva, FL in 2015 and the Artist in Residence Program at the Studio Museum in Harlem, New York, NY in 2012. By working across history painting, cinematic tropes, psychoanalysis, and post-colonial theory, Mokgosi creates large-scale project-based installations that interrogate narrative tropes and the fundamental models for the inscription and transmission of history.